What Be the Standard Features on Fridges & Freezers? Top-end reach-in units are typically manufactured of aluminum and stainless steel in a variety of combinations. Reach-ins generally utilize 20 to 30 lbs. of rigid and foamed-in-place polyurethane insulation to help maintain interior temperatures. At the minimum, reach-in refrigerators are manufactured to maintain an interior temperature of 40 degrees F or below, while reach-in freezers should be able to maintain interior temperatures of 0 degrees F. Some freezers can reach temperatures as low as -20 degrees F. For what reason, I have no idea. 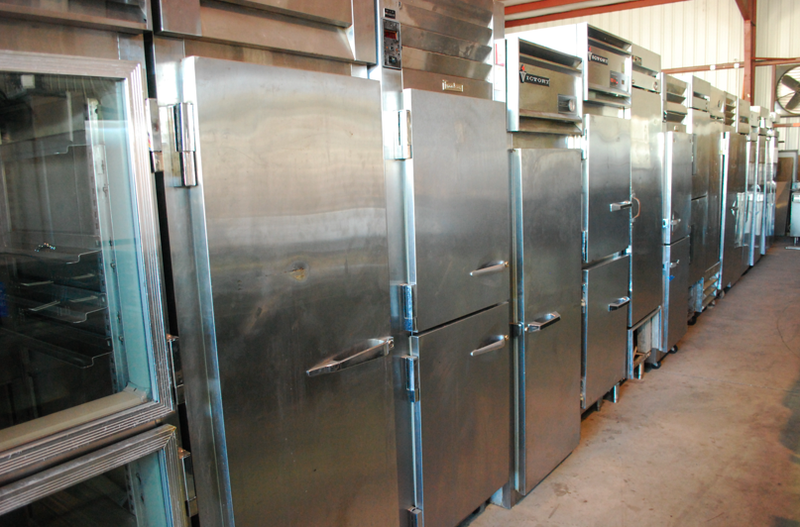 If you’re in the market for a used or new reach-in refrigerator or a new reach-in freezer, come on down to One Fat Frog Restaurant Equipment and check out our marginally impressive selection of used or new reach-in refrigerator or a new reach-in refrigerator, you will not be sorry. But you will be sorry if you don’t and to that I say, “it’s okay.” But you should know that One Fat Frog Restaurant Equipment welcomes quick cash deals and package deals for the entire stock of used commercial restaurant equipment – including used or new reach-in refrigerator or a new reach-in freezers. One Fat Frog Restaurant Equipment also offers easy financing – we can get you approved no matter what shape your credit is in.